After months of planning and arranging, finally the City Of Death guided tour was ready to make a start! Jonathan had invited me back in January, and before the end of the month I had bought my tickets. He had planned the tour out to make sure we visited as many of the locations used as possible. 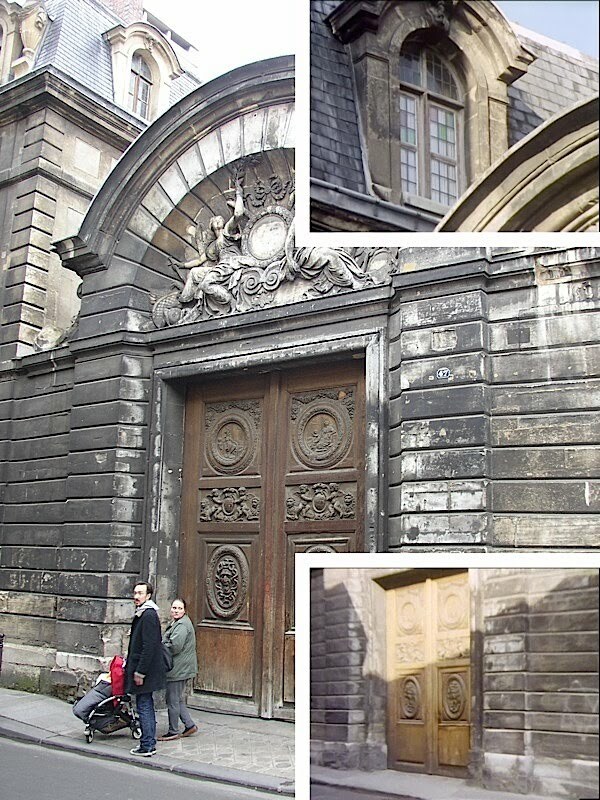 First up was Scarlioni’s Chateau, which is number 47, Rue Ville du Temple, not far from where we had all met up. Jonathan explained that the location is far from what it appears, and is not a chateau, though it is very large. I gather it has at some point been a restaurant. One thing I was keen to see was the skylight window that often follow an establishing shot of the wall and doors. The doctorwholocations.net website does not show this, and I wondered if it had been filmed elsewhere and its location wasn’t known. But sure enough it was right above the door to the left. It would appear there is a courtyard of some sort behind the doors, around which the house is set. I took my screen-matching photos and it was a good location for all of us to get the first group shot – and what location to take it! 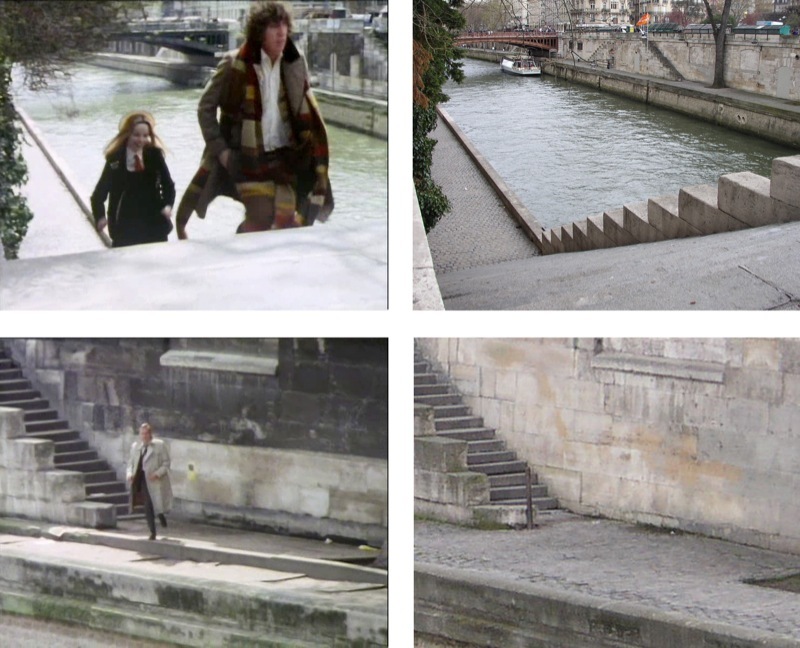 From here we moved on towards Notre-Dame, taking in a riverside footpath, along which the Doctor and Romana are followed by Duggan towards the end of episode one. 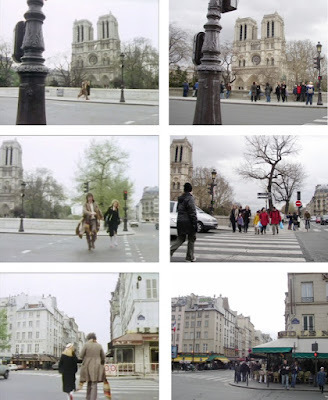 We then cross a small bridge called Petit Pont, where The Doctor and Romana run to get to Le Notre Dame Brassiere, where they have coffee earlier on in the episode. This was the perfect place for us all to stop for coffee ourselves. Sadly the actual spot where they sat was occupied, but we all found seating right by. Jonathan explained that the intention had been to film at another cafe, and the studio interior had been designed to match. However, when they came to film, it was a Sunday, the May day public holiday weekend and the cafe was closed. They had to quickly revise their plans to Le Notre Dame Brassiere instead, hence the interior fails to match the exterior they are seen entering. I took the opportunity to review a couple of parts of the episodes on my iPhone, and showed William the clip set at the very cafe where we were sitting. I could see the recognition in his eyes. We then passed a cafe which can clearly be seen in the background during one of the running-down-street shots. The café still bears the same name, but the signage has long since been renewed. Our next point of call was the Denise René Gallery at 196 Boulvard St Germain. This is where the TARDIS is parked for the duration of the story, though we never see it actually land. Jonathan explained that although the production manager had arranged the filming with the owners, when it came to it they found that the gallery was closed and locked up. In true acting style, Tom then pretended to enter the gallery with the intention of cutting as he put his hand on the door. He presses with too much force and set the security alarm off! In the professional manner of a BBC film crew, they fled and didn’t look back! I should mention that on the way to the gallery we stopped at a small park area which was the site of an only recently identified location. 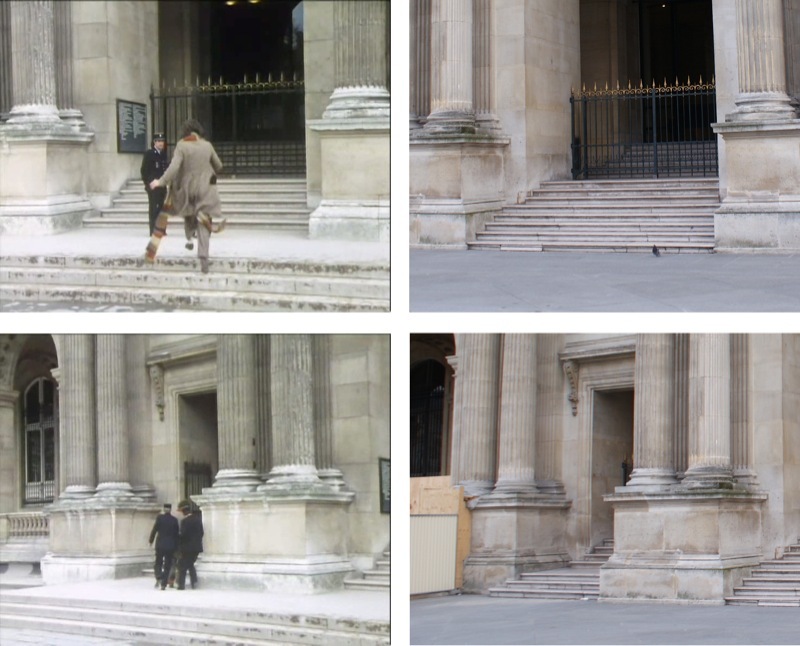 When the Doctor and posse are desperately trying to get to the gallery and the TARDIS in episode four, Tom is seen hailing a taxi, waving his hands frantically in the air over some railings. Although many of the shops and cafes behind him have since changed, the railing are still recognizable as the right ones, but it is hard to get a matching picture as the shrubs and trees have grown since the filming. It’s amusing to see that this is where it was filmed, as the gallery itself is well within walking distance further down the same street! 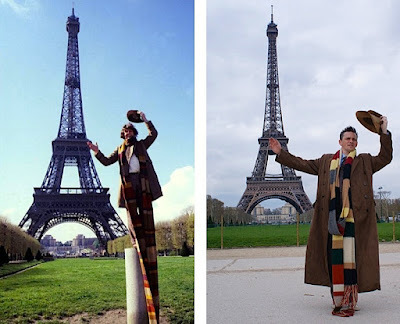 We then took a short Metro trip to get it to see the Effiel Tower – the exterior of which does not actually feature in the episode, though some scenes were shot on the observation galley of it for the opening and closing of the story. 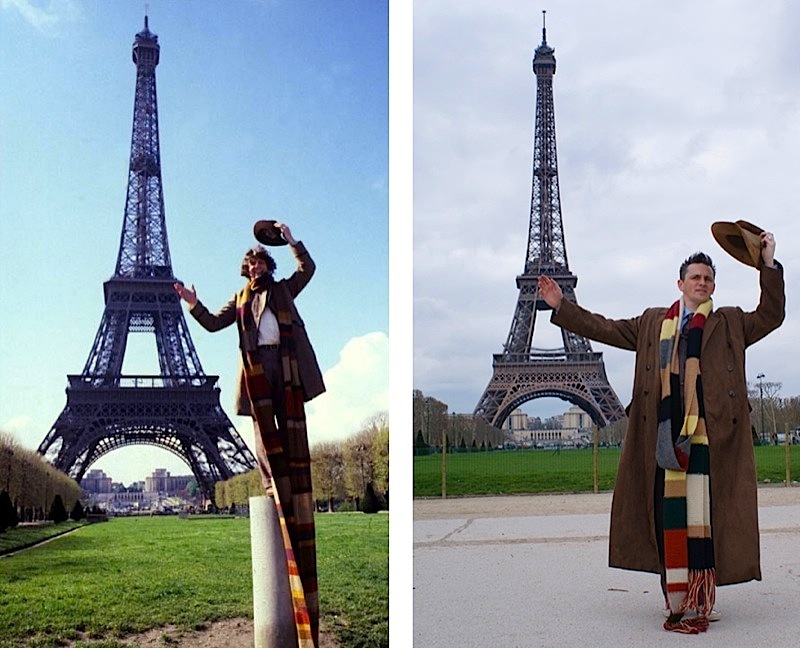 It can be time consuming and expensive to get to the observation gallery, so we gave it a miss, but we did, however, get to take one picture I really wanted on my trip – to copy Tom’s pose with the Tower in the background. We found the spot, but annoyingly the bollard he stands on is no longer there. I had brought along my fur-felt fedora hat and the Who scarf my Mother had knitted me way back in 1977! I had gone for the extra long season 16 look - so it went round my neck and hung to the floor just like the real thing – especially since it had stretched in the meantime! 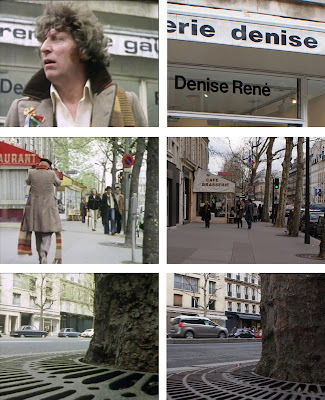 We then returned to the station and took another little Metro trip to see the Dupleix station, from where The Doctor and Romana get a train, taking in views of the Eiffel Tower through the window in episode one. This took us to the Avenue des Champs Elyées, along which The Doctor leads the way back to the TARDIS in episode four. This leads down to Place de la Concorde, which is seen in episode one, where The Doctor and Romana walk across the square. From here we walked to Rue de Rivoli, along one side of which is a colonnade of shops, along which The Doctor and Romana are tailed by Duggan. Consolation was found upstairs in the form of the English language bookshop, where you could buy all manner of UK based products, including a plethora of Union Jack emblazoned tourist items. Why you would go to Paris and buy a memento of the UK beats me! Elsewhere though the shelves of jelly babies proved a perennial hit. So much so stocks were cleared and a member of staff was dispatched to the basement to get new supplied. A notable dent was put in these too, leaving me wondering what the management were thinking looking at sales figures . . . . why were SO many bags bought in one hour!? 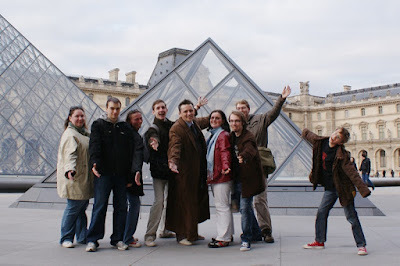 It is then a short walk towards The Louvre itself, where the Mona Lisa is displayed, and in episode four, stolen! There has been substantial remodeling and additions to the central courtyard of The Louvre, most notably the building of an swanking great glass pyramid! All this has raised the level of the ground, and some of the steps to the gallery have been removed. 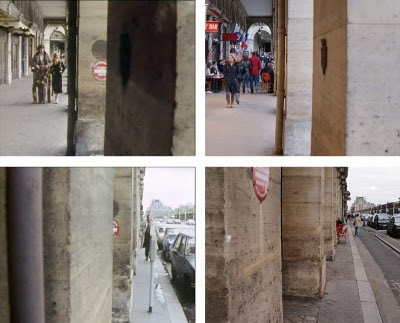 The entrance where The Doctor approaches two gendarmes is still identifiable, by a process of elimination of the others, each of which have eliminating features. I have always thought this is one of the most lubricious pieces of dialogue and sloppy plotting: The Doctor approaches them for news and they say “The painting, the Mona Lisa, it has been stolen.” Upon The Doctor’s cry of “What? !”, they happily lead him into the gallery. How come they seem to know The Doctor suddenly? There has been no scenes to date establishing an advisory link between him and the French police, and besides, if one of France’s prized treasures had been stolen, surely the building would be in a lock-down situation and no-one would be allowed in or out??!! All this nit-picking drew the tour to a close, and it only remained to get one last group shot of everyone who attended, next to the Pyramids Of Paris . . .
You can see a full album of the photos from the tour below. FANTASTIC. That is so cool. Sounds like it was quite the day trip. Always interesting to see what's changed over the years and what hasn't.